Buy a Chevy Camaro the smart way. Prices are rising and parts supply is excellent, so here’s how to buy one with wisdom. Words Richard Dredge. Photography Julian Sandiford. Buying Guide How to get yourself a great-value Sixties Chevrolet Camaro Mk1 1966-1969 in a rapidly rising market. Spurred on by Ford’s success with the Mustang, Chevrolet developed its own pony car for 1967. Built for just three years, the first-gen Camaro was available in the UK but few were sold – they were left-hand drive only and cost as much as a Porsche 911. Since then a few cars have been privately imported into the UK, but this is still a low-profile classic here so remains reasonably affordable. Values have risen in recent years, reflecting an American market where the more collectible editions have appreciated sharply. With most UK-based Camaro buyers sourcing their cars form the US, the state of the market there has a direct impact on UK prices. Don’t be put off by left-hand drive or parts-sourcing worries – you soon adapt to sitting on the left and just about everything can be sourced, often in the UK. So with plenty of bang for your buck, excellent reliability and superb parts availability the Camaro makes a lot more sense than you might expect. Our expect advice comes from Robin Gray of autopontiac. co.uk and Bob Mueller of streetsideclassics.com. 1967 MY The Camaro was introduced in September 1966 in 1967 model year (MY) form. Pillarless coupé or convertible bodystyles; 230ci (3767cc) straight-six or 327ci (5356cc) V8 engines. Optional Rallye Sport (RS) package saw headlights hidden behind a redesigned grille. The SS package brought a 350ci (5733cc) or 396ci (6496cc) V8 with up to 375bhp. Racing-focused Z/28 had a 302ci (4947cc) V8, quicker steering and improved cooling. Of the 220,906 ’67 Camaros built, 602 were Z/28s, 34,411 had the SS pack and 64,842 were RS editions; buyers could combine RS and SS packages. 1968 MY Revisions included front and rear side-marker lights plus improved ventilation. 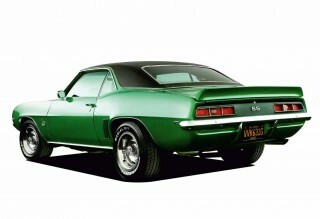 Chevrolet built 235,147 ’1968 Camaros; 40,977 had the RS package, 30,965 were to SS spec and 7199 had the Z/28 option. 1969 MY The bodyshell was re-engineered to look longer and lower, the nose got a prominent V-shape, and the front and rear lighting was redesigned. Camaro production totalled 243,085 this year – 37,773 had the RS package, 36,309 were to SS spec, 20,302 were Z/28s. An Indy 500 pace car replica was also available; 3675 convertibles were delivered and 200-300 coupés. Importing from the US is generally necessary – few Camaros change hands in the UK. Most owners rebuild a car to their own spec then keep it forever. At the time of writing the exchange rate was around $1.27 to the pound which is worth remembering; many people think it’s still $1.50 or even $2. The rule of thumb is that whatever the price in dollars, assume that’ll be at least the price in pounds – if not more – by the time you’ve paid for shipping and taxes. Specification makes a big difference to value. One or two options will increase a Camaro’s desirability but not necessarily its value; what makes a difference to its worth is multiple options. You’ll pay a premium for originality in the US but it’s not so important in the UK. Some variants are particularly sought-after in the US, but are relatively unknown in the UK. The ’1969 Indy Pace Car replicas can fetch $60,000; dealer-built COPO (Central Office Production Order) cars – including the Corvette-engined Yenko Camaro – can cost $200,000. Rarest and most valuable of all is the 427ci V8 ZL-1. Just 69 were made and they can sell for $600,000 on the rare occasion they come on the market. Bodywork and structure should be checked carefully for rust; not all US states have a warm and dry climate. Hotspots include the lower edge of each front wing, behind the wheelarch, and the boot floor. The latter is especially important on convertibles, which can be prone to leaks. Floorpans and footwells rust as well as the panels under the rear seats. Spring hangers don’t rot too badly but they’re complex to repair because of poor access and the parts aren’t available, so everything has to be fabricated from scratch. Look in the corners of the windscreen where it meets the dash; the top of the dash is part of the bodyshell and it rots so the glass has to come out to effect proper repairs. The rear deck can also be weakened by corrosion and the double-skinned rear valance rots; the inner skin is part of the section of metal that joins the two rear chassis legs together. The engine, gearbox and suspension sit in a subframe (or clip in US-speak) which is mounted to the bodyshell via rubber mounts which disintegrate. Polyurethane alternatives are available and you can even fit aluminium parts, but these reduce refinement and are likely to lead to squeaking and rattling. Parts availability is excellent but there are lots of poorly made bits so don’t just opt for the cheapest – that’s true of panels, trim, brightwork and mechanical components. 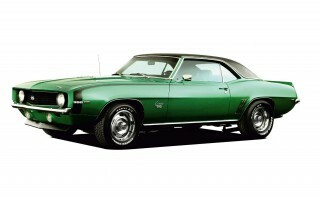 The Camaro’s simple construction means a DIY restoration should be straightforward – and you can buy a new bodyshell for a 1967/1968 Camaro for around $12,500. If you’re buying a project get the work done in the US, where labour rates tend to be far lower. Parts availability is also better there, which further reduces restoration costs. Engines are not stressed, whether six- or eight-cylinders, and few of these cars are driven hard nowadays, so engine wear is only likely if the car is still fitted with its original unit – but many Camaros are. The small-block V8 is known for its smoothness, power and durability; it’ll easily last 200,000 miles if looked after. Likewise the straight-six, which should cover 100,000 miles before it needs a rebuild. No matter what state the engine is in, putting everything right is cheap and easy. You can rebuild a V8 yourself for around £700-£1500, or you can buy a new 350ci engine from £2500 (£4000 with all ancillaries). Few owners rebuild six-cylinder engines; they spend the cash on a V8 conversion instead. Transmission All Camaros apart from the Z/28 came with a three-speed manual transmission as standard, with a four-speed manual or two-speed Powerglide auto optional for extra cash; a three-speed Turbo Hydramatic auto ’box was introduced for the ’1969 model year and all Z/28s came with a four-speed manual transmission. Around a fifth of buyers opted for the four-speed manual; just over half ticked the auto box. In the UK most buyers want an auto but US buyers prefer a manual. All transmissions are extremely tough, especially the autos, but if a rebuild is needed budget £1500-£1800. The parts are cheap to do the work – it’s the labour that costs. Most manual-gearbox Camaros came with a 3.42:1 rear axle and most autos got a 2.73:1 differential. But as well as these ratios buyers could spec 2.41, 2.56, 3.08, 3.23, 3.55, 3.73, 3.90 and 4.10 axles. If the car hasn’t been restored expect at least some tired mechanicals. Steering boxes get overtightened so need to be slackened off. Springs and dampers get tired; budget £300 to replace the lot. There are ten ball joints in the front suspension, all of which wear. They’re £20-£30 apiece to replace but it may be that the Pitman and idler arms are also worn; new replacements cost £100 and £30-£50 respectively. There are half a dozen makers of ball joints and some are better than others; Moog is reckoned to be the best. If the stub axle’s spindle is worn on a drum-braked car you have to upgrade to discs because replacement parts aren’t available. Such conversions are common anyway; budget £1000 for the complete kit including stub axles, calipers, discs and master cylinder. Trim was exclusively vinyl, with no leather option. Restoration is easy because new replacements for everything are available – doorcards ($200-$600 per pair), seats ($500 each), seat foams ($150-$200 per pair), seat covers ($125-$240 per set), carpet sets ($150-$200), headlinings ($80-$135) and more. 1 Projects are rare in the UK; $5k-$15k (£4k-£12k) in the US. 2 Roadworthy cars start at £20k+, and £30k will secure something nice. A superb Camaro with a few upgrades is typically around £50k. Key value-adding options are four-wheel disc brakes and aircon. 3 RS and SS packs will add another 5-10%. 4 Convertibles are rarer than coupés so prices are higher. 5 There’s no demand for six-cylinder Camaros and you’d struggle to sell one on – most have had a V8 installed by now. ‘I’d fancied an American car for a while, but a passenger ride in a 1968 Camaro set me on the path to finding my own Camaro RS/SS from the same year. I started saving, then in early 2017 I began my search, which was restricted to the UK so I could inspect any potential purchase. If I were to do it again I’d look in the US because there are more cars to choose from and the standard of cars for sale is probably higher; if necessary I’d pay for someone to check out any potential purchases. ‘Throughout my search I relied on the help of the Camaro Research Group (camaros.org), a bunch of knowledgeable enthusiasts who hold a vast amount of data. The car I bought has matching numbers but needed some bodywork attention. I didn’t mind that; my priority was to stay as close to original spec as possible for an authentic 1968 experience. Says Santa Pod commentator Colin, ‘A friend bought a 1969 SS and I fell in love with it. I couldn’t find anything suitable here so I searched in the US and stumbled across what seemed to be the perfect car. The owner spent 90 minutes going round it with me on Facetime; I could see that it had been cherished even if the bodywork needed some attention. I bought it and used Golden Chariots (goldenchariots.com) to ship it over, a painless experience. ‘I knew it wasn’t matching numbers so I wasn’t afraid to change its colour or modify it; it now has a 454ci (7.5-litre) V8 dynoed at 615bhp. The parts availability for these cars is incredible; you can get anything and nothing is expensive. My biggest cost is fuel because it averages 8mpg; the most I can expect is 13mpg. The mechanical simplicity combined with durable parts means servicing is cheap and easy; over several years I expect to spend £300-£500 per year on maintenance. Having owned a series of drop-top BMWs, in 1998 Brett fancied something completely different so he started looking at American classics. Says Brett, ‘I looked at a Corvette but wanted a four-seater, so the Camaro was an obvious choice. I found a late-1966 car with the 327ci V8; the brakes needed overhauling but it was an honest car. ‘It had a hairy camshaft installed so I had to detune it a bit to make it tractable. Too many of these cars have been heavily modified which can affect reliability and usability; it’s getting ever harder to find an early Camaro that’s still close to original spec. The engine in mine has been tuned quite a bit, plus the car has been lowered and it’s got chrome wheels; I’d say it has been restored and sympathetically upgraded. In the time I’ve owned it the car has done only a few thousand miles which is why I’ve spent little more than £2000 in that time – I do all of the servicing on the car myself. Time-warp car, in very clean condition – looks like it did in 1967 when new. 327ci V8 engine, Powerglide automatic transmission, power steering, power brakes. Incredible condition interior that looks months and not decades old. Nice pale yellow paint, rally wheels. I cannot find any evidence either on top or underneath of any welding ever being done. In stock now with Classic American Car Sales in Essex. V8s are not stressed and all parts are readily available. Most owners upgrade them. Window regulators can fail, the front because of wear and the latter seize up because of a lack of use. But it’s not a difficult or pricey fix. At less than 4.8x1.9m the Camaro will fit in most UK garages; The optional vinyl roof can mask corrosion – especially on 1969 cars where it covers the C-pillar – so check the edges for bubbling.